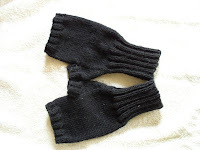 These socks did not want to be knit! I ran out of yarn twice and just gave up. I'll wear them where the foot doesn't show. I like the pattern and have started again for Peg's birthday. There's not much to show yet, due to Christmas knitting. Why am I a lemming? I've jumped on the wrist warmer bandwagon. Jeff lost one of the mitts I made him last year. At least they weren't hiding in a closet. 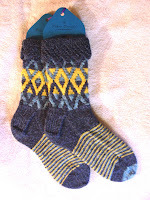 I've put the pattern on Ravelry. The yarn is Aussi Wool, a worsted weight yarn, knit on US #5/3.75mm needles. 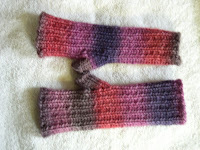 When I saw my niece in November, she expressed interest in..... wrist warmers. I don't know if I'll see her again this year, but I'm ready. This pattern is called Stulpen. The yarn is Regia 6-ply, knit on US# 3/3.25mm needles. I needed a gift for Jan. Guess what. More mitts. 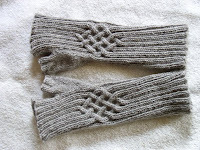 These are Maine Morning Mitts by Clara Parkes. Yarn is Patons SWS stripes in Natural Plum. Needles US #7/4.5 mm. This was a one day knit! Continuing the lemming thread, I'm knitting her a scarf, the Noro striped scarf from 2 colors of Patons SWS. It's simple and really fun. I'm not working full time this week, so should have it ready for the family celebration on Friday. It's colder than blazes here, so good for knitting. I did go out Sunday to see grandchildren in a Christmas pageant. Lots of kids in costumes! Each group sang a Christmas song or two, connected by a little story telling. My favorite participants were a horse and a cow. They were in the group that sang "Away in a Manger". Their Mom was stage manger for the program. I do have group pictures, but you had to be there. I've been sewing fleece hats for gifts. That's part of why I'm in my shop this week. No sewing machine or thread at home. I'm in for a couple of hours in the morning and then gone.